Esau’s cry has not faded from our modern hearts, it’s just harder to hear in the noise. A desire for blessing is a cry for approval. It is a question of identity, and from where we draw it. Lacking earthly fathers who love with unconditional acceptance, we turn to our peers and our social networks; if they praise us, we feel loved. We turn to our lovers; if they embrace us, we feel desirable. We are passionate about interacting with celebrities; if they notice us, we feel validated and worthwhile. Symptoms of creative insecurity are similar to those of personal insecurity. We badger friends and loved ones for approval, crushed if they dislike our ideas. We care too much about counting YouTube views. We lurk in quiet desperation behind the stages and blogs of celebrities, sure that if they liked our work, we wouldn’t want to toss our paints in a dumpster and wipe our hard drives in despair. Being a Christian can complicate this burden. We know that every good thing is a gift from God. But who hasn’t heard the jokes? And we all chuckle, but the terror grows inside – Is that me? Every good thing comes from God. But is this good? Creativity is worship insofar as it is, at its essence, a response. I hear the Word, and I respond with silence, in adoration, in appreciation by picking up the basin and the towel. It is a romantic response to this Person whom I adore. He is beautiful! I want nothing more than to be in his presence. I love him! And so I sing and I write. If I could paint or dance I would do that as well. I forgive someone who couldn’t care less about being forgiven. I try to reach out across the vast distance between me and my brother or sister. Because it is a response, it does not originate with me. He speaks. He moves. He is beautiful. We respond. We create. We worship. But if creativity is our response to an unconditionally-loving heavenly Father, our work needs no further justification. Don’t throw out the paints. Don’t wipe the hard drive. What you create is worthwhile because it is offered to Him. Please don’t think I’m advocating for mediocrity. While creative performance is driven toward excellence by fear and neediness, a worshipful response dances toward excellence in a passion of love. It is natural that in responding to His beauty we should reach beyond ourselves to reflect Him. I am suggesting that instead of judging our own finished works as either Valuable or Worthless, we discern whether they are a Private Response or Meant To Be Shared. Allow me to compare and contrast. First, take the picture at the start of this article. It is Jacob Blessing the Sons of Joseph, a 1656 oil painting by Dutch artist Rembrandt van Rijn. It is housed in the Museumslandschaft Hessen Kassel in Kassel, Germany. Not much question, this painting is Meant To Be Shared. 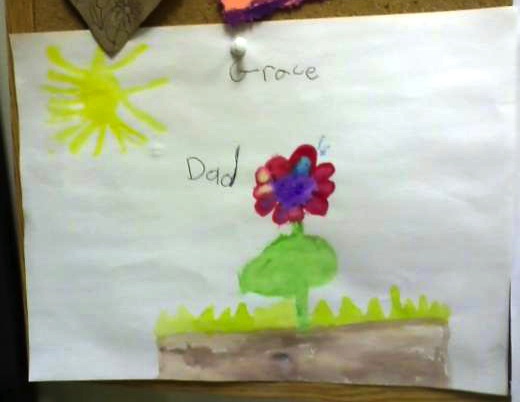 Now, look at this watercolor, housed on the cork board in my office. Don’t dare tell me this watercolor is less worthwhile than Rebrandt’s oil! Don’t tell me the artist wasted her time. Don’t criticize it at all, because I see her in every nuance. This is is a Private Response of love from daughter to father. This may be the hard part – accepting that some of what we create is not Meant To Be Shared. Even harder is that it’s nearly impossible to discern the difference until a work is finished. There are many reasons to prefer creating things which are Meant To Be Shared. A few of them are good reasons; most of them are not. Most come from confusing our work with our worth. This is a blessing to me today. Thank you! Kari, I missed your comment at the time, but am glad to have found it. It’s always encouraging to know someone liked a piece of my writing. Thanks for taking time to let me know. And of course you’re very welcome!